“Tactics are the actual means used to gain an objective” thus a specialized tool may be strategic in accomplishing a goal. Tools of this nature tend to be ruggedized for the rigors of the mission, in this case emergency preparedness. I received a tactical flashlight from Survival Hax for the purpose of evaluation and review. This rather small flashlight (just over five inches long) has some big features. At first glance you might notice it’s aggressive appearance with a knurled handle for a positive grip. A focusable thousand lumen beam is located at the head while the button power-switch is located at the end. The flashlight case is constructed of aircraft grade aluminum and is crash, pressure, and water resistant. The power is provided by interchangeable sources. The primary power source is a rechargeable 3.7 volt lithium battery and the secondary power option is an adapter that holds three AAA batteries. This adapter is a great provision as AAA batteries are generally accessible from any grocery or convenience store and enables you to stock up and carry extra batteries when operating in off-grid situations. Then there’s the integrated electronics that provides five lighting modes: Low, Medium, High, Strobe, and SOS. Each mode is accessed by a full or half click of the switch. I discovered a slight inconvenience that once you click the flashlight off it advances to the next mode so that when relit you may have to cycle through to access your preferred mode. The rechargeable battery will last three hours on high and five and a half hours on low. I imagine that the strobe mode would use even less power but would be aggravating to use but could extend the battery life in a pinch. There are uses of the tactical flashlight for which it was not intended or designed. Being the firecrafter that I am I could see a couple of ways that I could make fire using some of it’s parts for both solar and electrical methods. The head of the flashlight uses a convex lens as part of it’s focusing capability. I took off the retaining ring, removed the lens, and held it curved side toward the sun and about an inch over some crushed dark dry leaves and created a coal that I coaxed into a flame. Next, I removed the battery and took some fine steel wool and stretched it out to touch each end. After a few attempts the steel wool sparked sufficiently to ignite a paper towel. Then by using one of the alternate power AAA batteries I was able to make a flame by connecting each end using a thin hourglass shaped foil gum wrapper. These are just three benefits outside of the flashlight’s intended use. Because of it’s rugged construction I would imagine that it would also make a formidable self-defence weapon. Although the tactical flashlight comes with an attached wrist strap it unfortunately was too small for my hand to fit through it. The Survival Hax Tactical Flashlight is a solid tool that is easily stored in a glove compartment, backpack or pocket and weighs only a third pound. It’s good to know that it has these multiple capabilities that can be used in various survival scenarios. 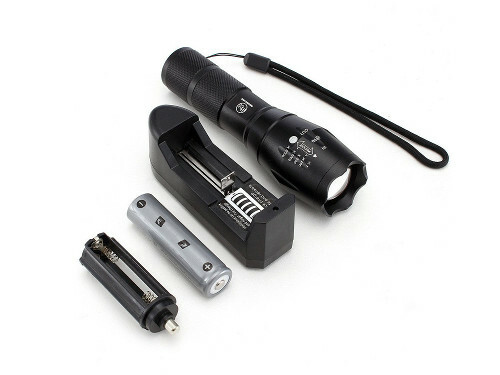 For more information on Survival Hax’s Tactical Flashlight you can visit their website at https://survivalhax.com/products/tactical-led-flashlight . 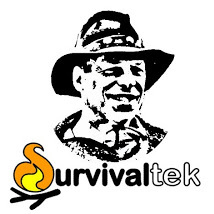 This entry was tagged AAA, Electrical, Fire, flashlight, Light, Solar, Survival Hax, Tactical. Bookmark the permalink.